Jasmine Harris and Gabriel Sheffield need your help. The lives of Jasmine Harris and Gabriel Sheffield, both 25, won't ever really be quite the same. Cupid's arrow hit the Manassas Park couple about a year and a half ago while they were at a happy hour with friends. Now they're hoping to win the hearts of millions of people nationwide after entering and becoming finalists in Essence Magazine’s 2010 "Will You Marry Me?" contest. In order to enter, Sheffield had to write a letter to the magazine describing just how much he loves his sweetheart. 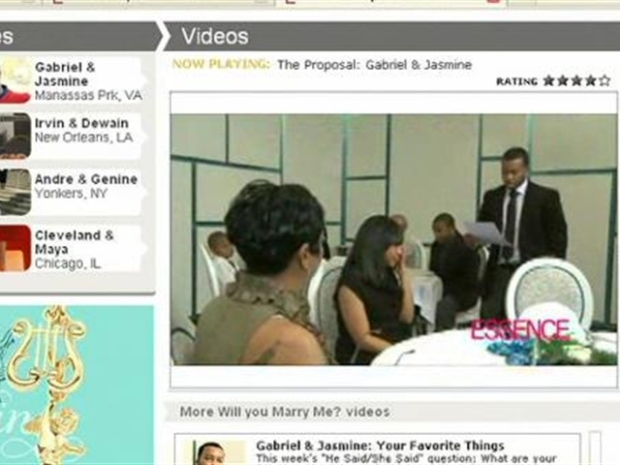 Jasmine Harris and Gabriel Sheffield beat out hundreds of contestants to become finalists in Essence Magazine's 2010 "Will You Marry Me?" contest. "The letter was so heartfelt to me... I was asking myself if they didn't pick me, something wasn't right because... how can you not pick that letter?" Sheffield said. Harris had no idea Sheffield had entered the contest last October, until he proposed to her with cameras rolling as a surprise on her birthday in December. "If you simply watch the proposal on the Internet, you can see how much love we have from that," Harris said, "but Gabriel actually does that in real life… not just for the cameras and tape." Since entering the contest, Sheffield has flown to New York for a photo shoot and is now featured in Essence magazine and on Essence.com. At stake is $10,000, a honeymoon in Hawaii, a wedding dress, and a wedding cake. The couple needs your votes. "I just want to give Jasmine the world," Sheffield said. "I want everyone to see that I love her so much... I want her to have her dream wedding and I want to do it in Essence magazine."